BrandON is a tool for monitoring how your brands and products are referred to on all digitally available media sources such as Web Portals, Twitter, Facebook or Google Plus. 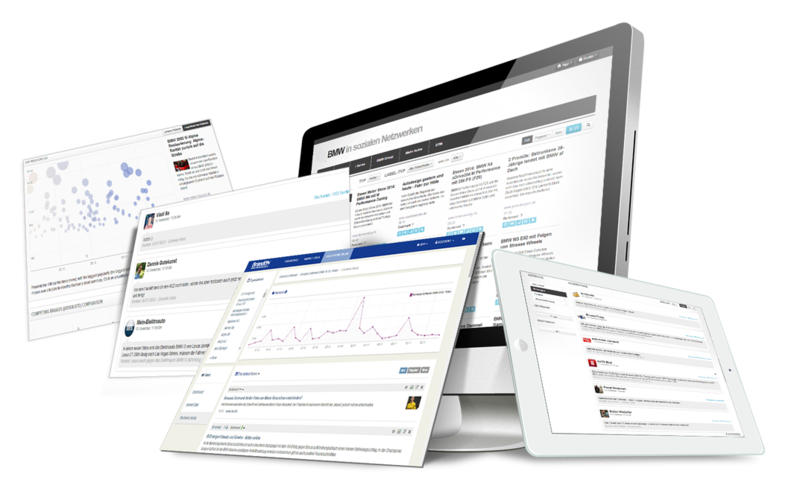 It collects information about all web content that mentions your brand. It tries to find out as many information about the given mention - who published it, where, how is the sentiment, how popular and how hot it got (how fast is it gaining popularity) etc. BrandON has an usable, nice looking and auto adjusting HTML5 Web Interface - you will have access to all the information from any device so you can be informed anytime. BrandON is a source of analysis and reports offering comprehensive knowledge about your Brand and potential customers. The tool allows the observation of their behavior, their opinions, and the related trends (e.g. a brand's range in Social Media). BrandON offers a great variety of charts and lists. When using BrandON SEE the possibilities are sky high. The amount of analytical tools available is astonishing and you can bring your BI or any other data source in to the mix. Read on to find out more about BrandON SEE. Based on the analysis and interpretation you can decide to take action. Later on you can verify how your actions performed by looking at the data in BrandON. Therefore BrandON can be a great tool to support your marketing campaigns. The application can verify carried out marketing activities, advertising campaigns, as well as viral shares on the Internet. It is a tool to effectively carry out research and analysis, and checks whether the actions taken have been successful for the customer, label, or brand. Our approach is based on developing a generic software platform for Social Data Collection and Analytics on which we put products and applications crafted for the individual needs of our customers. Our generic software platform is called BrandON Media Monitoring Engine (ME). It collects data from all digitally available media channels and analyses it. The data is enriched with additional information like the stock market mood, detected language, locality or actuality, as well as impact and reach. BrandON ME is entirely individually configurable using a modern web interface (Backend Interface). Our offer includes a Software as a Service distribution model. With this service, we deliver the requested monitoring and analysis. 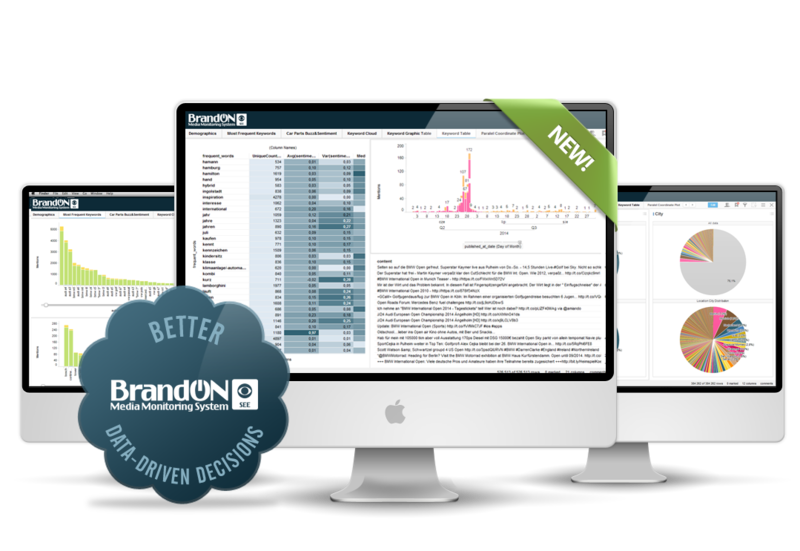 BrandON SEE is a new product that was realized in collaboration with TIBCO Spotfire®. It combines Business Intelligence with Social Intelligence in one visualization software that is unique on the market. The interface is either predefined or can be customized by the user in order to deliver the right answers to their specific questions. 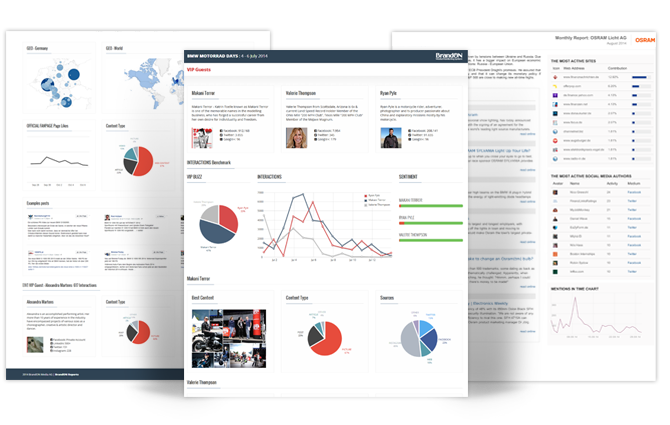 It gives a more advanced, full overview of opinions, comments and news about your brand on electronic media in combination with your own business data in order to get complete insight about trends surrounding your whole company. It allows to merge the Social Data from BrandON with the BI data in a secure environment of your company behind a corporate firewall. It empowers Business Users to meet their Social Intelligence (SI) and BI requirements with minimal IT involvement. "Self-service BI Features are key To empowering Business Users"
BrandON BOOM is a tool to illustrate (Social) Media Data with a web-based interface. It filters mentions that are relevant for your brand. It organizes them by overall popularity, by popularity over a defined period of time, or by most recent. It can evaluate them also by sentiment. The tool supports companies in making better business decision based on social media trends and to immediately act upon mentions. It contains a convenient interface for exploring mentions (to drill-down to details). The product can be predefined for specific use cases, for example for Investor Relations. It is already used by dozens of companies in different sectors and sizes, amongst others, by over 60 customers of equinet Bank AG. It allows to create automated information portals about given topics. The portal not only aggregates information from different sources but also rates the information and displays it arranged according to that rating (i.e. hotness, popularity). The information can be moderated and entrenched. It also allows the republishing of selected information to external mediums like Social Media or on your website. This process can be fully automated by making the information selection be based on the information rating (e.g. the popularity). It can be used to set up public as well as corporate in-house web portals that can be customized to focus on any preferred subject matter. It enables semi-automated information curation, enriching of websites (i.e. with an iframe containing news about a selected topic), increasing media presence and user engagement. 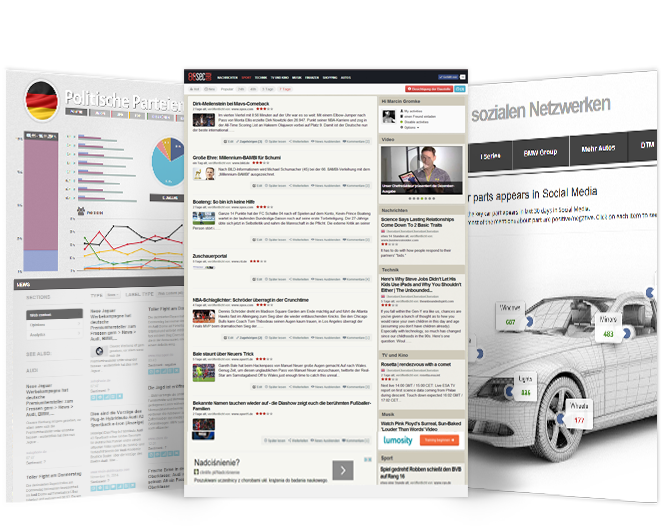 BrandON PORTAL is also suitable as an aid for publishers, who can fast identify popular or hot topics to write about. That gives them a higher probability of getting readers. BrandON Media AG is a company consisting of a team of engineers and businessman focused on delivering Electronic (including Social) Media monitoring, data mining and analytics solutions for mid- to big-sized companies. Their services encompass a generic software platform for social data collection and analytics. They form a broad product suite for generic applications as well as a range of very specific industry content and use cases e.g. for Automotive customers. "Our close collaboration with managers, product managers and sales departments gives us insight into the problems and needs of the industry." 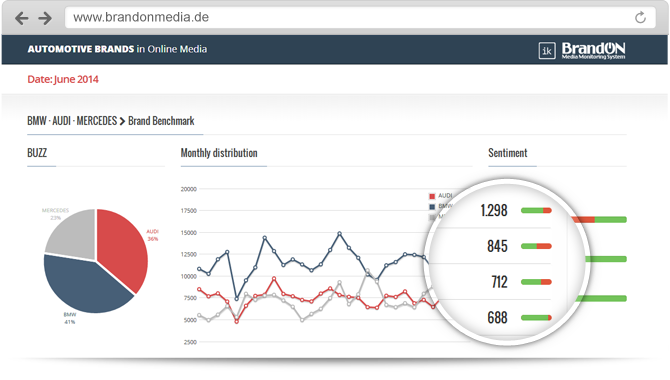 BrandON Media AG is a leading provider of media monitoring and analysis systems with BI integration. BrandON's platform solution combines digitally available media sources within a dashboard in near real-time. "Our specialization lies in the automotive, finance, airline, sport and consumer goods sectors, where we have the most experience and knowledge based on our contacts with clients. We believe that the best software can be created only out of deep understanding of its business users and their needs. We are open to companies from all industries which are willing to cooperate with us to get to this kind of state." Since 2010, BrandON Media has been working on its Media Monitoring Solution and established the first branch of the company in Gdańsk, Poland. Since 2012, BrandON Media is also present on the German market with its headquarter in Frankfurt. The team gained its tech and media experience and expertise by working with main publishers in Poland and Germany. The media publisher ESKA Radio (the biggest Polish radio network) launched its ESKA INFO portal (eskaINFO.pl) containing local news prepared by internet reporters and editors of Radio Eska. The content of the portal is complemented by an overview of messages from other sites, interesting facts about each city, as well as updated information on weather and traffic conditions. (...) A huge advantage of the INFO ESKA portal is an innovative system for aggregating content from other media. Mostly local media, which does not have a chance to break through with a message outside the district or the city. One of the most important elements of this innovation is the fact that it takes the social media popularity of these content into account, particularly among the target group of the portal (fans of Radio ESKA on Facebook). The system was developed by BrandON Media, a company specializing in developing dedicated solutions based on social media monitoring. 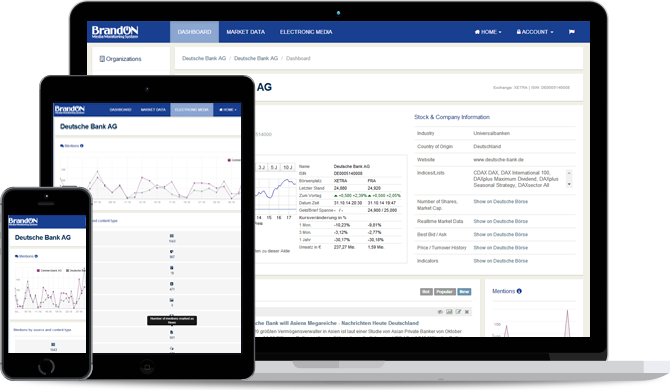 In a partnership with BrandON Media AG, a provider of social intelligence services for the capital market, equinet Bank AG has today launched the innovative social media tool "equinet BrandON Investor Relations". equinet, a provider of customised solutions for all financing and capital market topics, is thereby becoming the first investment bank on the market to enable its own customers in the designated sponsoring area to integrate data from securities trading, social media and investor relations within one tool. If you are interested in any of our product and services, feel free to contact us with any questions regarding your media monitoring experience. Upon request, we can offer you a demo version that fits your use case.